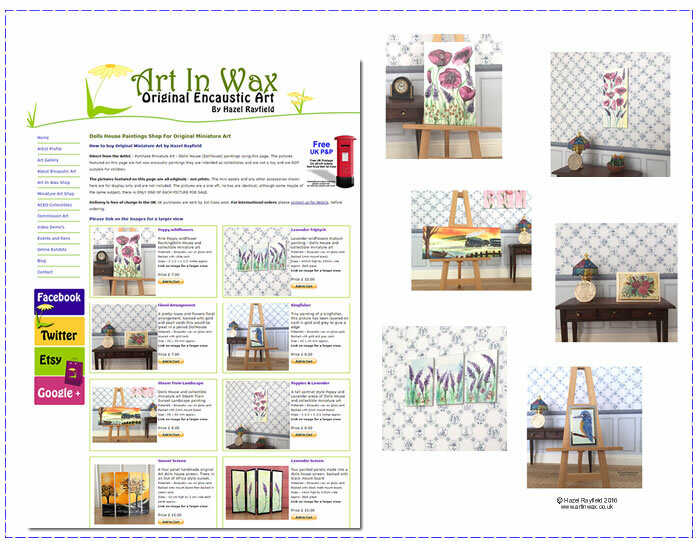 I thought it might be fun to do a brief update on what’s going on with Art In Wax at the moment. I have been painting lots of new pictures. Large and small, some of which are online in my Etsy and web shops. Some don’t make it into the stores as many sell as soon as I show them on Facebook, twitter etc so some of these I post on the website sold page, to show the new ideas and commissions. I have been doing more commissions than ever before, I love the challenge of painting for a specific theme or client idea. All commissions are original, I don’t do copies or reproductions. 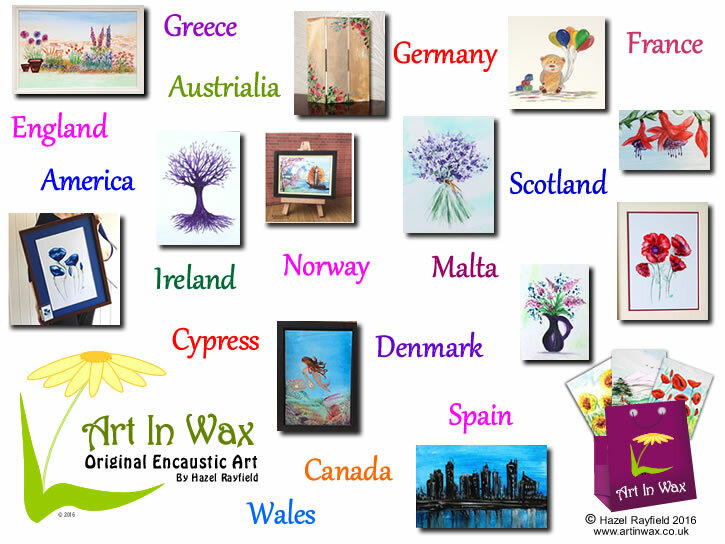 I sent my first painting to Germany this week which means pieces of Art In Wax are now in 15 countries on 3 continents. I have to pinch myself when I think hundreds of my paintings are hanging on walls and being displayed in homes and offices across the globe, sent from my small studio here in Southend Essex. 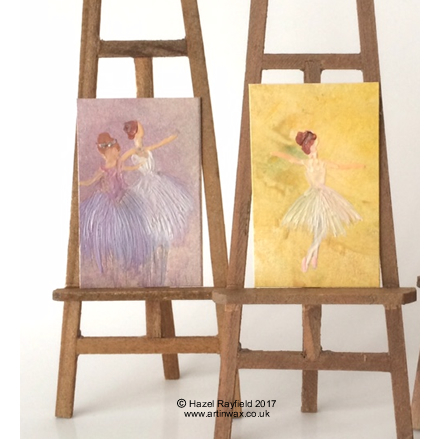 I have painted small size pictures as well as wall art for a long time, my ACEO collectible pieces have always been popular and in the past couple of years I have seen a big rise in the popularity of my tiny dolls house and collectible miniature art which is great as I do love the challenge of painting tiny. Over the past 5 years of painting and showing my encaustic art online I have met and communicated online with many of the people who now own pieces of my work, it is lovely to know how much they are appreciated. These people have become part of the Art In Wax and my journey, some have inspired me and challenged me in many ways for which I am very appreciative. As you can see from my blog my work has been featured in magazines, blogs and on YouTube. And I am currently working on an article with The Dolls House magazine for a artist profile piece coming out in 2017. I also have a couple of ideas for new blog posts on my blog. Including a look at Art In Wax in situ which I am currently researching. I love selling my miniature art and when you buy direct from the artist, be it via the Art In Wax websites, via my Etsy store on via a contact with me on facebook or twitter each purchase has a personal touch. Purchasing Miniature Art – Dolls House miniature style paintings can be bought direct from my website on the “Miniatures shop page” The pictures featured on this page are all hot wax encaustic paintings and are intended as collectibles for miniature art collectors and dollhouse owner, they are not a toy and are NOT suitable for children. 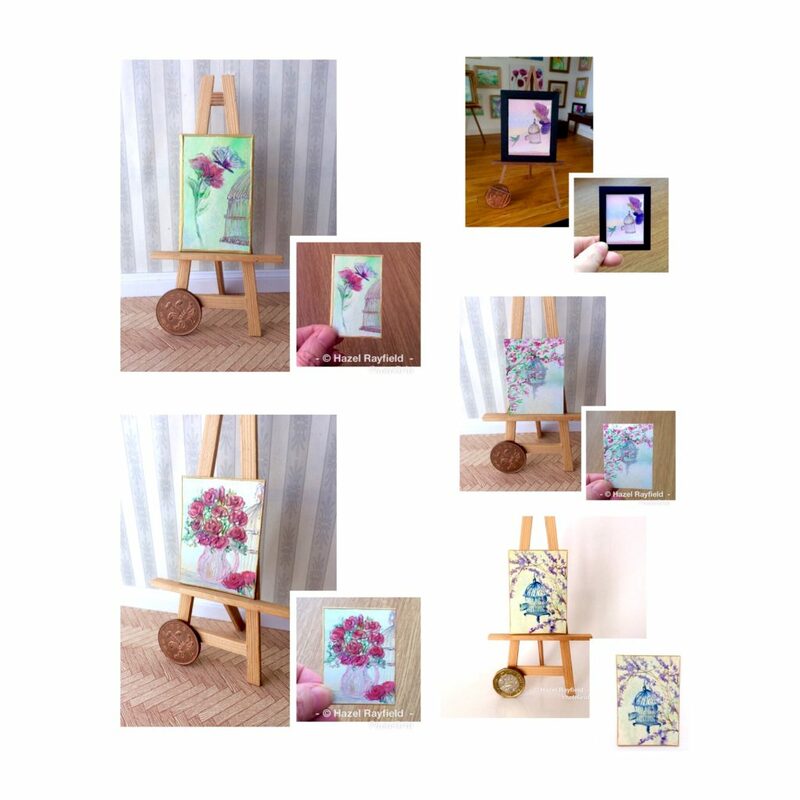 The mini easels and any other accessories shown here are for display only and are not included. All the pictures are original paintings, not prints and therefore are a one off ! No two are identical, although some maybe of the same subject, there is ONLY ONE OF EACH PICTURE FOR SALE. 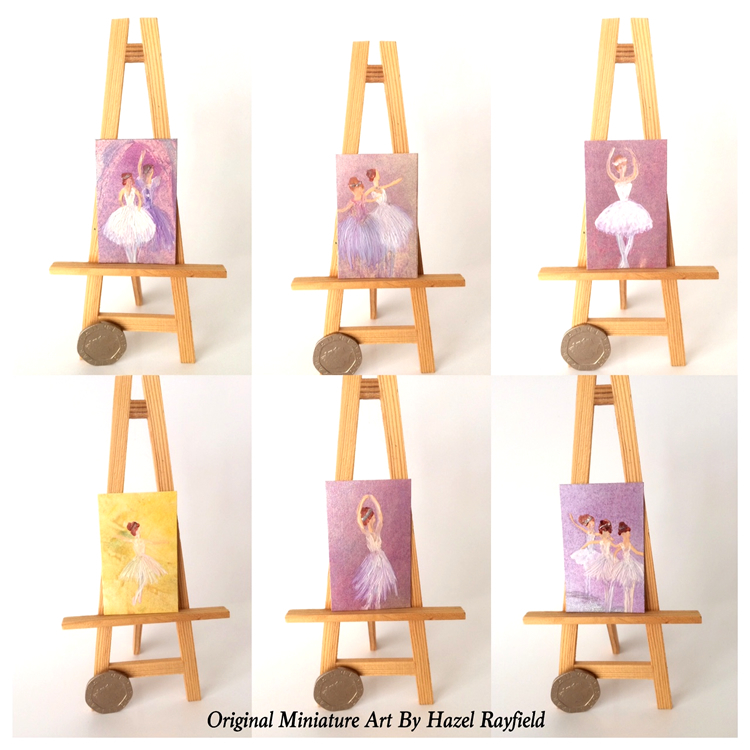 Why not visit the miniatures shop and see all the new paintings which I upload regularly, these six shown below are new today ! To see the most current paintings, I normally show them on facebook first, so why not follow the Art In Wax Facebook page and be first to see what’s new, in miniature and wall art too …..